Figure 1: Illustration utilized in many of the now three-year-old Plate Climatology Theory articles. Antarctic Continent (white), the branching 5,000-mile long West Antarctic Rift / Fault System (hatched black lines), below sea level and glacial covered Antarctic Continent (gray), surrounding oceans (blue), and land or ocean floor volcanoes (red dots). This realization has far-reaching implications concerning the validity of the entire Plate Climatology Theory. Why? Because it shows that Earth’s major fault/rift systems very likely have the heat-flow power to bottom melt the Polar Ice Caps, heat entire oceans, and chemically charge both our atmosphere and oceans. These assertions are all the building block principles of the Plate Climatology theory formally presented on October 7, 2014, and detailed in many follow-up Climate Change Dispatch(CCD) articles (see here, here, here, here, here, here, here, here, and here). This article will provide historical perspective and evidence supporting this claim. Let’s begin by clearing up misstatements made by many worldwide media outlets. No, the discovery of 99 new sub-glacial West Antarctic volcanoes is NOT a surprise. It has been postulated by many scientists during the last three years. 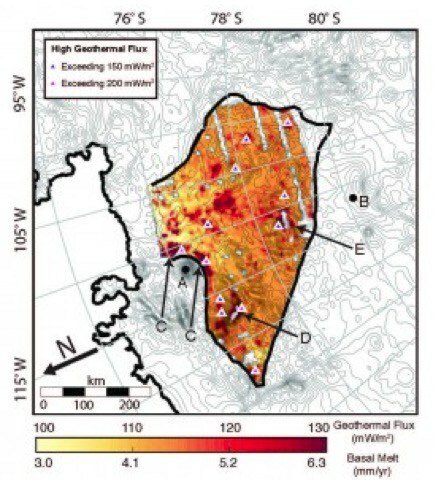 The notion geological heat flow might play a role in the bottom melting of selected West Antarctic glaciers and possibly the entire West Antarctic Ice Sheet (WAIS) was published on June 10, 2014, in a University of Texas at Austin West Antarctic Bedrock Heat Flow Study (see here and Figure 2). Next, the massive heat flow and chemically charged, heated fluid flow/climate-changing power of the Earth’s major fault/rift systems, including the West Antarctic Rift System, was formally presented on October 7, 2014, as part of the Plate Climatology Theory (see quote below). This was followed up and supported by many detailed articles presented on the Climate Change Dispatch website (see here, here, here, here, here, here, here, here, here, and Figure 1 atop this article). “The Sun, quite obviously, is the first order driver of earth’s climate, but a much neglected second order driver can contribute significantly to natural variations. The overall theory contends that periods of active earth tectonics and volcanism can be correlated to periods of active climate change and climate related events. To describe this new theory, the term Plate Climatology is designated. The theory was first formally introduced on October 7, 2014, after 10 years of research. In general, increased tectonic activity, either locally or globally, equates to more faulting and volcanic activity, which leads to more heat and fluid release from these active geological features into both the oceans and atmosphere. Altered heat and fluid input equate to climate change. This effect has been largely hidden from any scientific investigation because the heat and fluid release is primarily from two under explored/under monitored regions. First, Earth’s Deep Oceans which contain major geological features such as Divergent Plate Boundaries (tectonic plate pull-apart boundaries), Transform Plate Boundaries (tectonic plate side sliding boundaries), Convergent Plate Boundaries (Subduction and Obduction Zones), and High Heat Flow Volcanic regions. The associated heat and fluid release from these geological features act to alter ocean temperatures, densities, and chemical compositions. The “Altered Oceans” then influence or drive climate changes and climate-related events. Secondly, Earth’s Polar Ice Caps contain major geological features such as: Divergent (tectonic plate pull-apart boundaries), Transform Plate Boundaries (tectonic plate side sliding boundaries), and High Heat Flow Volcanic regions. The associated heat and fluid release from these geological features act to alter sub-ice sheet temperatures. Lastly, the University of Edinborough just published on May 15, 2017, an article describing what many previous geologist and researchers had previously postulated, the discovery of numerous additional sub-glacial West Antarctic volcanoes (see here). Clearly, the media has sensationalized and misstated this supposedly unexpected discovery of more sub-glacial volcanoes. It is important to note that researchers from the University of Edinborough have in no way misled the public. Overzealous media outlets handled that task. Next, let’s discuss what the primary focus of this article. How exactly do the two new research articles and the massive amount of previous Antarctic data help bring the Plate Climatology Theory to the brink of confirmation? The short answer is that confirmation of the West Antarctic Rift System as the root cause of bottom melting of West Antarctic glaciers has many other significant and far-reaching implications, especially as related to the Plate Climatology Theory. Why? Because it strongly implies that not only does the West Antarctic Rift System very likely possess major climate-changing heat flow power but so do Earth’s other major fault /rift systems, as detailed below. 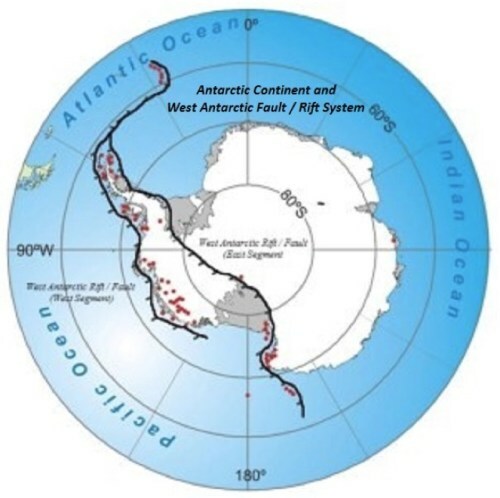 First a proper geological review of the 5,000-mile-long West Antarctic Rift System. This rift is a greatly underappreciated and a powerful source of climate changing and ice-melting heat flow and chemically charged heated fluid flow. 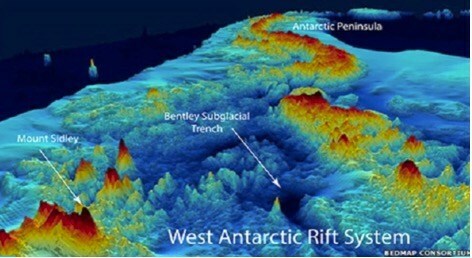 (see these previous CCD articles here, here, here, here, here, here, here, here, and here) This deep, world class rift zone is actively ripping the entire Antarctic continent apart and forming two distinct pieces, West and East Antarctica. We now know that West Antarctica is moving away from the East Antarctica at a rate of about two mm per year. In the process, it creates a complex network of deep-reaching open faults and fractures that tap downwards into deep Earth, igneous lava pockets. The vertical faults and fractures provide open pathways facilitating upward migration of both volcano-forming lava and massive amounts of heat flow onto the bedrock / basal glacier boundary. This rift also generates an associated huge complex of other heat-flowing geological features such as sub-glacial hot springs, hydrothermal vents (ocean floor hot geysers), and ocean floor volcanoes (seamounts). The Plate Climatology Theory refers these actively heat-flowing rift complexes as “Heat Flow Engines.” They are a major force of nature. The University of Edenborough’s “99 new volcanoes research study“ helped confirm the heat-flow and climate-altering power of the West Antarctic Rift System as per Plate Climatology Theory. Further confirmation that West Antarctic glaciers are melting from geological heat flow forces and not global warming came from just-released research from Indiana University. This research concluded that East Antarctica’s massive Ice Sheet is not melting and is quite stable (see here and quote below). This proves that worldwide human-induced atmospheric global warming is NOT affecting the entire Antarctic continent or its two separate areas. It’s impossible for one portion of Antarctica’s Ice (West Antarctica) to melt from atmospheric global warming and have the other portion of Antarctica’s Ice (East Antarctica) remain stable. Clearly, the melting of West Antarctica’s ice is not related to worldwide global warming, but rather the result of the West Antarctic Rift System’s geologically induced heat flow. The 1,100-mile-long and 200-mile-wide ocean floor Mid-Arctic Rift System has been mentioned in many previous CCD articles (see here, here, here, and here). These articles detail that rapid melting during certain recent time periods is clear evidence that geologic heat is the root cause of these erratic Arctic Sea Ice changes. The major fault/rift system complex located in the tropical Pacific Ocean, specifically off the coast of Papua New Guinea and the Solomon Islands, has been the focus of many previous CCD articles (see here, here, here, here, and here). These articles and Plate Climatology Theory explain how this rift is the active geologic engine behind all El Ninos and La Ninas. El Ninos play a dominant role in altering Earth’s climate, altering major Pacific Ocean currents, and affecting many marine animal migration patterns. This is the most climate-altering fault/rift system on Earth. Saved the is best for last. Plate Climatology Theory is now being accepted and explored by more scientific expeditions to understand how the bottom melting of glaciers occurs and affects the climate.